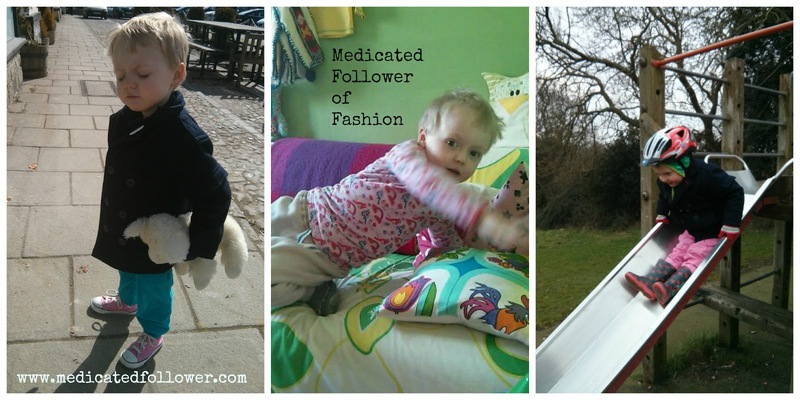 Medicated Follower of Fashion: Trendy Tuesday - Boys CAN wear pink! My son always heads for the skirts when playing fancy dress - and my daughter will always go for a pirate costume. They had a nursery that was painted green and a grey pushchair because even if we had known we were having a girl first time we weren't going to spend money replacing everything 2nd time round. I was given a hand me down thomas the tank engine duvet set for my son when my friend's little boy (who is a couple of days older than my daughter and has a little sister) moved into his big bed. It went straight on my daughter's bed and she loved it, why on earth it wasn't suitable for this little boy's baby sister was beyond me. My daughter lives in boys clothes, but its totally of her own choosing. She doesn't like pink and doesn't like dresses, her favourite outfit is a "boys" red t-shirt, a "boys" dinosaur jumper and "boys" toy story jeans. Why on earth are red, dinosaurs and toy story the preserve of boys? Yes, yes YES!!! I agree with all of this. I want to make sure people know I don't force Ethan into a skirt, or pink clothes, or to play with a barbie (actually, don't get me stared on Barbie...) or a train. I just let him choose what he wants. Of course, when he was a baby, he couldn't express his own opinion about what he was wearing. Now I always ask him what he'd like to wear, and what he'd like if I'm buying him something. He just chooses what he wants, I don't direct him. When I was reviewing Easy Belts I asked him to choose which one he wanted. He went for the pink one from the "girls" section. When I asked him what colour Converse he wanted when his feet had grown, he asked for pink. Of course, he chooses plenty of other colours as well.. I hate the gender gap between boys and girls clothes, I hate the whole blue/brown for boys and pink/purple thing for girls. My son used to wear a Katvig pink and blue striped babygro it was lovely. He doesn't wear pink because I have specifically brought him pink (sadly girls clothes) his preference is things with motorbikes on but I refuse to put him in anything with trucks or negative slogans which again seem only for boys; noisy, I'm trouble, messy that type of thing. I could rant about this for hours sorry! My son has a doll and buggy and used to take it out a lot, we never had any problems. He has a dolls house, I do imagine a point when a friend of his makes some negative comment, I hope he will have the confidence to make his own choices and not respond to peer pressure. I don't think you are exposing him to bullying I think you are creating a well rounded individual. The failing is society, the failing is morons in cars, the failing is people who can't think beyond blue for boys pink for girls and believe that by putting a pink bib on a boy it's a problem. I'm ranting now will stop. thank you so much Alex for writing this and sharing with us, I could not agree with you more! for that reason my shop has not got any gender divisions at all, there aren't any BOYS and GIRLS categories, the idea is to browse by brands or articles i.e. TOPS or HATS so that the buyers can judge themselves, I am certainly not going to influence anyone's choices ;-) lovely pictures of Ethan! that last SPACE top is amazing, there was a very similar one made by Swedsih Plastisock some time ago ;-) Have you heard that PINK was once boys' colour and BLUE was girls'? That's OK Anna! I knew this kind of post would fit in with the ethos of your shop. You stock just the right kind of clothes that can be worn by anyone and I love the fact you shop by type of clothing and not gender. That's how it should be, then as you say, people can make their own choices. You are right by the way, that top is Plastisock, not Smafolk. I had to guess when I was listing it in the blog post because that particular top is in the loft in a bag of age 2 clothes so I couldn't check. Plastisock completely left my brain so I guessed at Smafolk but I'm sure you're right.. What a twit I am.